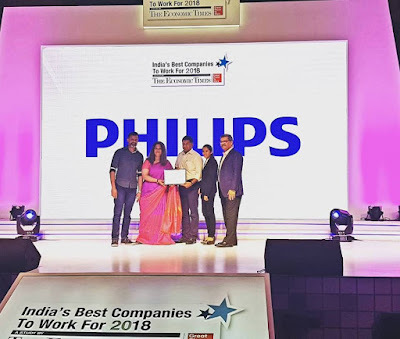 For the second year in a row, Philips Lighting India has been recognized as one of India’s Best Companies to work for in a survey conducted jointly by The Economic Times and Great Place to Work® Institute. As a part of the top 100 list, Philips Lighting has been acclaimed for its excellent work culture and key organizational values that the company believes in. Amongst 800 leading companies that participated in the survey this year, Philips Lighting India has made a significant progress from 82nd rank last year to the 69th spot this year. The survey independently evaluates participating companies on various parameters that define a great workplace, assessed through employee feedback and critical evaluation of company policies and practices. In a quest to continuously make the work environment better, Philips Lighting India has designed several platforms for the employees to bring forward their feedback, ideas and suggestions and over the last year they have worked towards improving the identified areas. The company also makes strong efforts to recognize and reward meaningful contributions by their employees across different functions and roles, through an innovative app called Light Up, using which employees can recognize their peers. Team leaders can also reward their team members under different category of awards, which makes them eligible for Light Up points that can be redeemed on popular shopping and travel websites. Signify became the new company name of Philips Lighting as of May 16, 2018. The legal name of Signify will be adapted in India in the beginning of 2019.